A class of antibiotics heralded as an essential future weapon against drug-resistant superbugs passed an important test. There’s now evidence that they can be used to treat serious infections in live animals (in vivo) without being toxic. Researchers created simplified, synthetic versions of teixobactin, a protein produced by certain dirt-loving bacteria that was first discovered in 2015. 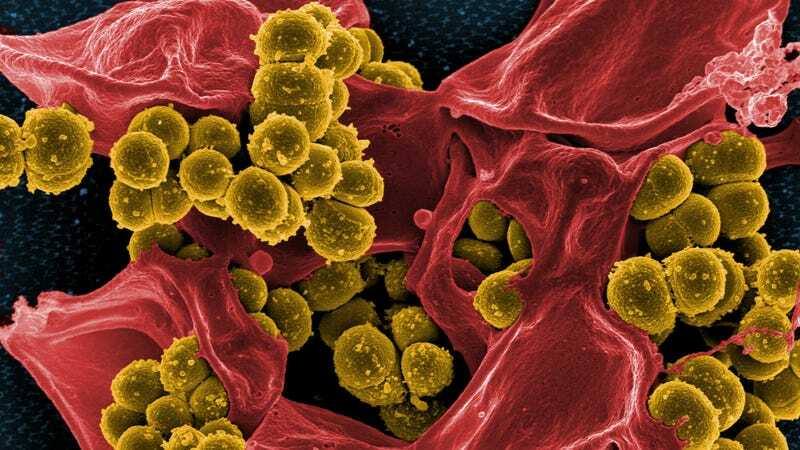 They tested the teixobactin in lab mice whose eyes were infected with one of several germs, including antibiotic-resistant strains of Staphylococcus aureus and Enterococcus. The most successful of these analogues was found to leave animal cells alone while still wiping out more than 99 percent of the bacteria in the infected eye. The findings were published in January in the Journal of Medicinal Chemistry. “Translating our success with these simplified synthetic versions from test tubes to real cases is a quantum jump in the development of new antibiotics, and brings us closer to realising the therapeutic potential of simplified teixobactins,” said senior author Ishwar Singh, a researcher at the University of Lincoln’s School of Pharmacy, in a statement. Teixobactin was the first molecule of its class to be discovered, after new technology made it easier for scientists to study bacteria in the lab that live in low- or no-oxygen environments like dirt. And though similar chemicals have been found since, it’s remained the only one so far shown to kill bacteria in a laboratory and in live animals, the authors say. What makes teixobactin so exciting is that it attacks bacteria from an entirely different angle than other antibiotics, mucking up the production of their cell wall by interfering with two proteins that other drugs don’t interact with. The trick only works on gram-positive bacteria, limiting its utility. But it’s been consistently shown to easily destroy bacteria resistant to conventional antibiotics, and early evidence suggests that its unique approach will make it harder for bacteria to develop later resistance. Natural teixobactin, however, is likely too toxic for people to ever take. And attempts to develop safer versions haven’t been able to replicate the molecule’s potency. But last winter, Singh and his team published research showing that the synthetic analogs they created could kill bacteria in a petri dish as effectively as natural teixobactin. Other new potential classes of antibiotics are in development, but teixobactin-based antibiotics might be the first to make it to human testing. If so, they would be the first truly unique antibiotics to emerge in more than 30 years. That journey, Singh cautions, will still be a lengthy one.